I never heard of this author until a friend recommended this book. He said it was awesome and free if I apply for it on “Booksneeze.” I must say, this a pretty astounding book to stumble across. 1) Life over God is an attempt to make life controllable – follow certain principles and God will automatically bless you. “The mystery and wonder of the world is lost as God is abandoned in favor of proven formulas and controllable outcomes.” The “Church is a business” mentality fits nicely into Life over God. 2) Life under God “sees God in simple cause-and-effect terms – we obey his commands and he blesses our lives, our families, or nation.” Just find what God wants and do it so God will do good things for us. 3) Life from God is essentially an interest in God only to gain benefits from Him, not God Himself. How God can bless me is the first concern. Health and Wealth/Prosperity Teachers view God like this. 4)Life for God is a posture bent on serving God in some way, working hard for him and being “expended accomplishing great things in God’s service.” God himself is lost for the sake of the work. The book points out the flaws in making these four postures the primary postures in life toward God, and advocates for the fifth posture – life with God. Adam and Eve were created to be with God, but the fall severed this. Then the whole story from Genesis to Revelation is God reconciling humankind back to being with Him as companions again. Jesus died and resurrected for us that we may be with him. Revelation ends with God dwelling with his people forever. Life with God is the point. 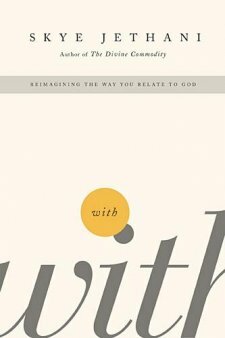 The fundamental premise of the book is so appealing: God wants a relationship with us. This isn’t something a posse of postmoderns cooked up; it’s a very ancient, biblical idea. It is amazing how frequently “with” and God are coupled together in the Bible. I noticed this little preposition more in my Bible reading since starting this book, and God “with” people is definitely very common. At one point in the book, Skye spends some time on the “New Atheists,” writing that they’re really attacking these other religious postures, but refuse to grapple with the idea that God desires to be with us. Many objections to the Christian way and oddities in the Bible are given a hearty rejoinder when you have this perspective (as I’m finding from reading The Christian Delusion alongside With, but that’s for another day). So many parts of this book are just beautiful. I loved the chapter “Life with Hope.” He brings out the ancient imagery of the sea representing darkness, chaos, and evil — then how God demonstrated His power over these forces, whether by saving Noah’s family from the flood or opening up the Red Sea for the people of Israel. This book is more than about the various postures people have toward God and the one you should have. It is a book about what God is like. It portrays God as an incredibly Grand Character, whose love is big, whose desire for a real friendship with us is deep, who is the kind of friend we really need. And when you see what an incredible Being God really is, the correct posture – with God – is easier to slip into. I think he left out some qualifiers in discussing the various postures. Some of them are clearly found in the Scripture – people are to live lives for God (2 Corinthians 5.15), and under God (1Peter 5.6). Those are completely valid prepositions to describe human relationship with God. Yes, God’s goal may be “life with God,” but this is accomplished to its fullest by living our life on purpose for God, submitting under God, etc. I wish Skye made this clearer. For example: the “Life over God” people’s focus on principles. He criticized the view that if we follow xyz principles found in the Bible, God will automatically bless us. He contends the Bible is NOT a book of mere principles. Skye is right, but the Bible does contain principles! Cursory reading of Deuteronomy, Proverbs, and Pslams reveals this. Principles aren’t bad. The problem becomes when we make it all about principles and not about God. God has ordained reality to be a certain way, and many principles are generally true even when practiced by pagans. For instance, the Bible contains principles for a strong family. The early Roman Republic didn’t have the Bible but still gained a great and strong empire, in part because they so happened to follow good family principles. Also, there’s repetition and a great bit of overlap between the four postures. A lot of times the chapter on “Life over God” sounded a lot like the chapter on “life from God.” But this is not a big deal. He’s using these phrases as a simple but powerful teaching tool, and there is a good bit of overlap in these concepts anyway. Last, some parts really could have used more interaction with the biblical text. For instance, he has a marvelous section on how eternal life’s experience starts now, not when we die. He could have looked at John 5.24 or 11.25, or at least put it in parenthesis to back it up. But in the end, I highly recommend reading it. I got this as an e-book for free from Nelson Publishers through the Booksneeze.com program, in exchange for a review of it on this blog. (I wasn’t required to give a positive review). If you have a blog, you can apply to get the e-book free. If not, get it anyway. It’s a book you will want to read. Included here are a few of many great quotations. I cannot provide a page number due to the format of the e-book, but I’ll note the chapter. “Identity is not something that can be fully revealed in this age, and it is not a quest that we can complete on our own. Identity is something that our Creator alone can bestow on us. As we journey through this life, we may catch glimpses of who we are – sinner, servant, manager, or consumer – but these are only broken images in a dim mirror. Our true selves cannot be discovered by living under, over, from, or for God. It is something that will only be revealed when we are fully with God.” (Ch. 9, Life With Love). I’m reading a book right now called With by Skye Jethani. It has to do with how we live our lives in relation to God. I really like it and think he is mostly dead-on. But I got to wondering how little I know about the guy who is writing these things. So, I got on his website and read his bio. Ok. But I don’t really know him. How does he actually live his life in relation to what he is writing? Does it work in his life? How does he eat breakfast, treat his family, counsel people in hardship? Can I see it rather than read what he tells me? Reading an author isn’t enough for me anymore. Alot of times I want to ask him or her a question about what I”m reading. I want to live with the author, follow him around, and see how he lives his life, if he practices what he preaches. In Academia, we know the rule that you always interact with the person’s ideas, not attack the person. To say, “well, Professor A’s idea, X, is bad because Professor A is a jerk and treats his students unkindly” is the logical fallacy Ad Hominem, against the man. You keep the private life separate from the ideas your discussing. But while this is the academic rule that must be followed in any discourse, we cannot totally divorce the whole person from his ideas. Our lives run on ideas. If we behave badly, there is some bad thinking in their somewhere. And when an author is telling you in his book how to live your life, the question of how he lives his own life becomes all the more important. There are too many manipulators and predators out just to make a buck. I’m skeptical. I’m looking for authentic books written by authentic people. After I read Michael Eaton’s book No Condemnation, which is now among the best books I’ve read, I began really thinking of how I could get to Kenya and help in his church. What a thought! Being the assistant of a such an authentic thinker/pastor/theologian and following him around. Yeah, I’m crazy, but don’t tell me you don’t have crazy wishes too! That said, I admit you can learn quite a bit about a person from reading their books, especially books on life. From reading Skye’s book, I think he really believes, lives, and thinks about what he is advocating. That said, I do wish I could hang out with him for a while. If, by some chain of unlikely events, I become an author, I would want to do just that – have interns, assistants, or whatever and incorporate them into my life. People to help me at work, live in my home, eat my dinner, and be mentored. But like I said, I’m just another guy with crazy wishes.